You’re seeing remnants of the old Davao, along Oyanguren St. 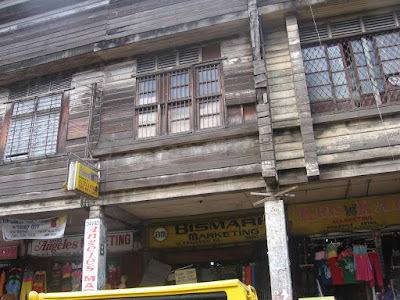 Whenever I see old wooden (and stone too) buildings like this, I itch for the resources to be able to renovate them! I always like to visit the historic places! It's too back maintenance and renovations cost so much! This is something I miss...There's something with old wooden houses, there's so much character in it. Hilds, unfortunately, this picture will be the only remembrance of this site, sooner or later this will be demolished in lieu of concrete ones. Leif, you're right, renovating is more expensive than building up a new one. Afv, I agree with you! Arvin, tagalog ka ba bisaya? hirap ako magtagalog ... heheheh. Thanks for dropping by! This place like the Quiapo AREA IN manila.